This post is part of a Water Storage series where we are answering questions we’ve received from waters about storing water for emergencies. 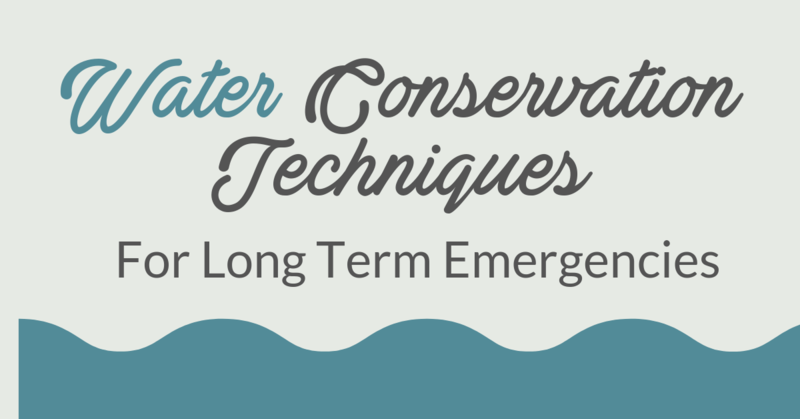 Today we’re going to talk about how you can save your precious stored water in an emergency where you may not have stored enough (see water container post). Ideally you will have a filtration and purification method, and ability to gather more water in case of a long term emergency, but this may not always be the case. First off, FILL YOUR WATER CONTAINERS. We hear from SO many people that they have containers that they just haven’t gotten around to filling yet. Bathe in a large bucket or bin, and use bottles that have the types of tops that squirt (refillable condiment containers) when pressure is applied. This will help with faster rinsing. Use the remaining bath water in the bucket for flushing toilets. Use coralite bath wipes, for quick bathing. Store some no rinse shampoo and conditioner for hair. Have paper plates, plastic cups, and disposable tableware to use to allow you to cut back on dish water. Use recipes that mix most ingredients in one dish or pan that you serve straight from to cut back on dish-washing. Store wet wipes and hand sanitizer to help clean up messes and wash hands. Tap into your water heater and toilet tanks for water if you run out of stored water. Wear your hair in ponytails, or wear hats when you can’t wash your hair as frequently during prolonged times with no water. If you have a swamp cooler that runs on water, make sure you have back-up cooling methods such as fans or wet rags to cool your body off during hotter weather. Fill liquid soap/detergent bottles with water. You’ll have water for washing small load of dishes. Soapy water for hands, and the bottles squirt out better then soda or juice containers. Save water from cooking noodles or other foods to use for other things. Use water from canned vegetables. Don’t wait until you are out of clean clothes to do laundry! If you’re always on top of your laundry, hopefully if crisis hits you won’t be stuck with 7-10 loads of dirty laundry to do. If you have to do laundry get a bucket, put a little baking soda, a tad of water, plunge by hand or with plunger. No need to rinse with baking soda. Baking soda will eradicate smell too. If you’re water has a funny taste, store drink flavoring to improve the taste. You can also aerate the water by pouring it back and forth between two containers. It adds oxygen to the water and gets rid of the stale taste. Flush conservatively. Use water you previously used for bathing or washing dishes to flush the toilets.